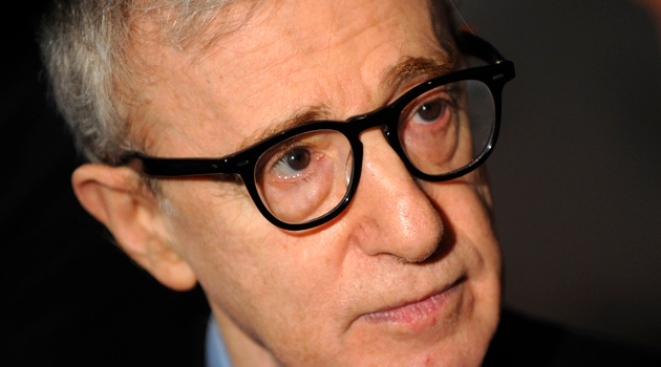 Woody Allen debuted his new film at Cannes, "You Will Meet a Tall Dark Stranger." Love, death, the terrible pitfalls of aging, romance between older men and younger women — they're all part of the Woody Allen canon, whether in his films or when he's just shooting the breeze. Allen's latest mix of comedy and drama, "You Will Meet a Tall Dark Stranger," premiered Saturday at the Cannes Film Festival, presenting an ensemble of characters dealing with familiar issues at the heart of the filmmaker's 40-some movies. The film features Naomi Watts, Anthony Hopkins, Antonio Banderas, Josh Brolin, Gemma Jones and Freida Pinto as an ensemble of Londoners coping with failing marriage, stymied ambition, the yearning for new relationships and the fear of mortality. In a news conference, Allen addressed many of these issues, along with such matters as why he shoots films in London rather than near his home in Manhattan and why he has not costarred in his recent pictures. — On aging: "I find it a lousy deal. There's no advantage in getting older. I'm 74 now. You don't get smarter, you don't get wiser, you don't get more mellow, you don't get more kindly. Nothing good happens. Your back hurts more. You get more indigestion. Your eyesight isn't as good. You need a hearing aid. It's a bad business getting older, and I would advise you not to do it." — On May-December romances: "It's a good laugh-getter, and a good provocative kind of thing, so that's really why I use it. … It gives me something that you can get good situations from and good jokes from." — On London: "The films that I make in London I could make in New York. They would just be more expensive to make in New York. It's a pleasure to work in London, because the summers are cool, the skies are gray, good for photography. There are wonderful crews and wonderful actors." — On not appearing in his films: "For years, I played the romantic lead, and then I couldn't play it any longer, because I got too old to play it, and it's no fun just not playing the guy who gets the girl. So unless I can think of some way to do it, no. … You can imagine how frustrating it is when I do these movies with Scarlett Johansson and Naomi Watts, and the other guys get them. And I'm the director. I'm the, you know, that old guy over there is the director. I don't like that. I like being the one that sits across from them in the restaurant and looks in their eyes and lies to them." — On death: "My relationship with death remains the same. I am very strongly against it." "You Will Meet a Tall Dark Stranger," Allen's 10th film at Cannes, spins a convoluted tale of troubled lives as Alfie (Hopkins) becomes obsessed with aging and leaves his wife, Helena (Jones), eventually marrying a young, gold-digging actress-prostitute (Lucy Punch). Alfie and Helena's daughter, Sally (Watts), supports husband Roy (Brolin) while he struggles to finish a novel that might fulfill the promise of his first published book. Meantime, Roy falls for a beautiful neighbor (Pinto), while Sally develops feelings for her boss (Banderas) at an art gallery. Helena finds comfort from a quarter in which Allen himself places no faith — the prognostications of a fortuneteller. Everyone needs their own little fictions to cope with the harshness of life, he said. "I do feel that it's a grim, pitiful, nightmarish, meaningless experience," Allen said. "The only way that you can be happy is if you tell yourself some lies and deceive yourself, and I'm not the first person to say this or the most articulate person on it. It was said by Nietzsche, it was said by Freud, it was said by Eugene O'Neill. One must have one's delusions to live. You look at life too honestly and clearly, life does become unbearable, because it's a pretty grim enterprise, you must admit."